whats the best thing to use at the bottom of the cage if ur igg is gravid? how can u tell if they are gravid and how do i prepare??? You will end up using possible a garbage can on it's side with a hole cut in the attached lid...or if she's still small enough for a covered kitty litter pan, then this would work, too. They don't always use the boxes we so diligently make for them. Most igs I hear of laying on everything BUT the nest. When your ig becomes gravid, one of the first things you'll notice is constant digging and scratching at everything. 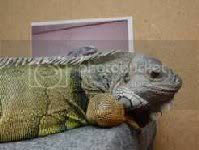 But, although it is always possible that an iguana can become gravid this time of year, its not very likely. Late fall and early winter are usually the critical months. When you start noticing this odd behavior, feel free to let us know and post any questions you have. I've got quite a bit of experience dealing with gravid females, so I should be able to help you out. In addition to www.anapsid.org , you can also have a look at Jennifer Swofford's site at www.baskingspot.com/iguanas/igbook/. 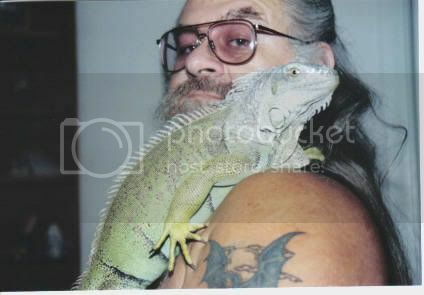 Much of her information came from anapsid, but its laid out in smaller sections that deal with the basic, most important details of the various aspects of iguana care. I'm a bit late chiming in on this one but Zok gets gravid in late winter/early spring. She has a tendency to lay around Easter time.